The beginnings of musical instruments, both folk and classical are traced to their earliest origins. It is a fascinating store of information about their structural evolution and musical quality. They are studied in relationship not only to myth, folklore and religion, but in the light of intercultural movements and the development of society. The book is a simple study which will be of interest to the lay reader as well as the musicologist. Dr. B. Chaitanya Deva (1922-1981) was educated at the Universities of Madras, Banaras and Pune. He retired as Assistant Secretary (Music) to the Sangeet Natak Akademi. For the pioneering work on the tonal structure of the tamboora he was honoured by the Akhil Bharatiya Gandharva Mahavidyalaya Mandal with its first Doctorate in Musicology. He was also Research Associate in Ethnomusicoloy at Cologne University. Author of a number of books on music and art, he specialized in the psycho-physics of Indian music, ethnomusicology and the study of musical instruments. WHILE there are learned and specialised works on our musical instruments, there are not many which are written for non-specialists. Books on particularized aspects of organology such as instruments in sculpture, folk instruments, catalogues of music and such others provide information to the scholar who undertakes deeper researches in the field. The present book, however, has attempted to gather together a wide range of data and to present them in as simple a manner as possible. 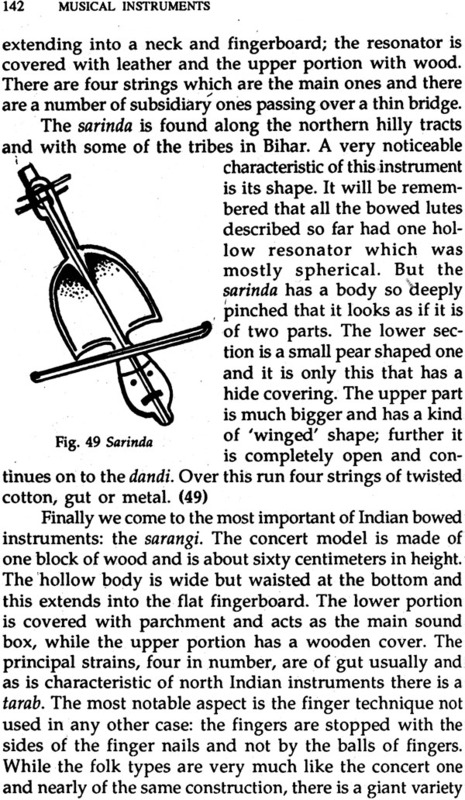 It has become an unfortunate habit with many of us to think of the history of only 'classical' sophisticated musical instruments such as the sitar, the tabla and the veena: that too a textural history. We tend to forget the very vast area of tribal and folk instruments which are the far and near forerunners of these concert instruments. 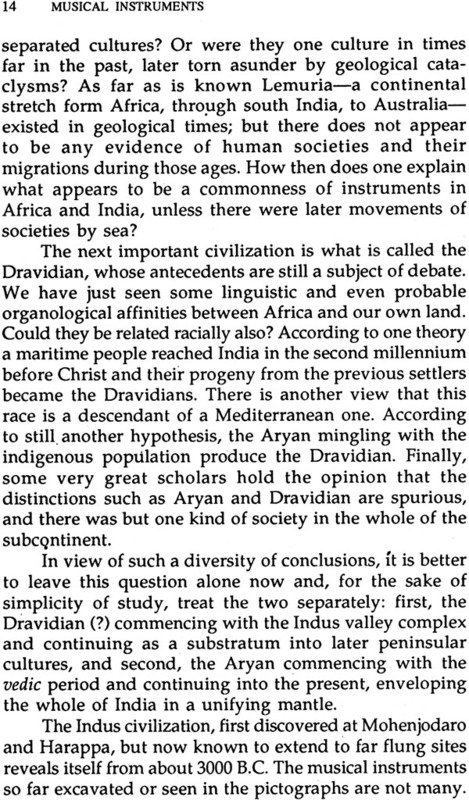 A divisive or parochial attitude-the folk versus the classical, the Hindustani versus the Karnatak, for instance-vitiate the entire domain of knowledge. But no society is isolated for ever. Depending on the nature and use of media of communication, every culture has given to as well as taken from others, thus being in a state of perpetual flux. 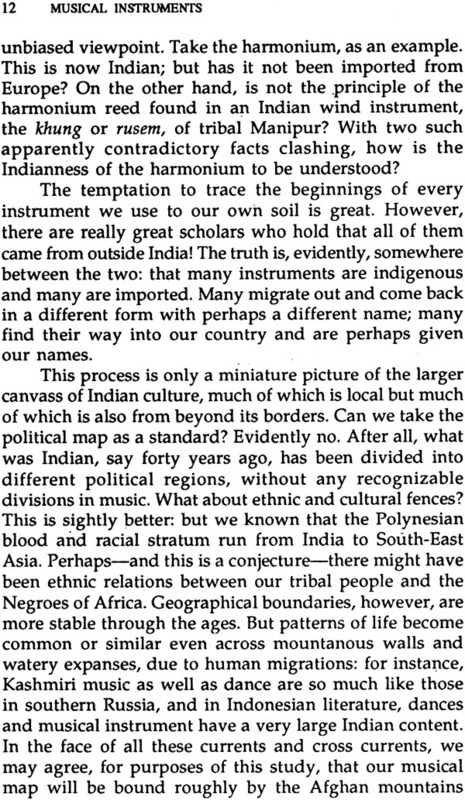 Hence it is interesting and fruitful to study the intercultural movements of our instruments. 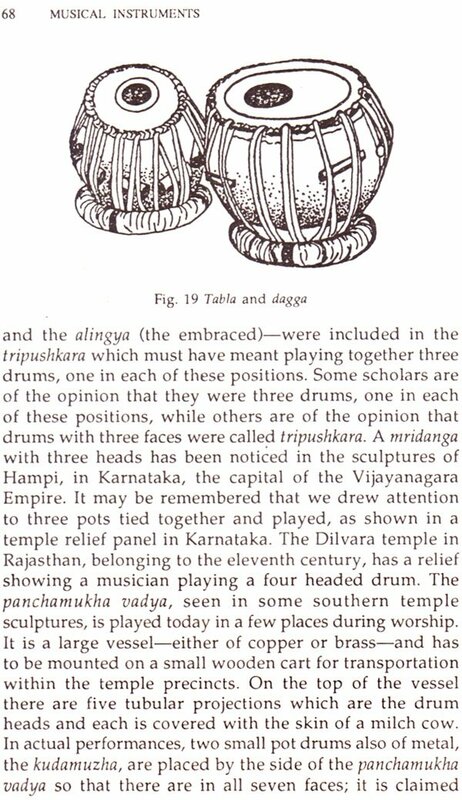 Further, a musical instrument is very often closely connected to mythology, totems and taboos of a people; and much therefore can be learnt of their lives from their instruments. 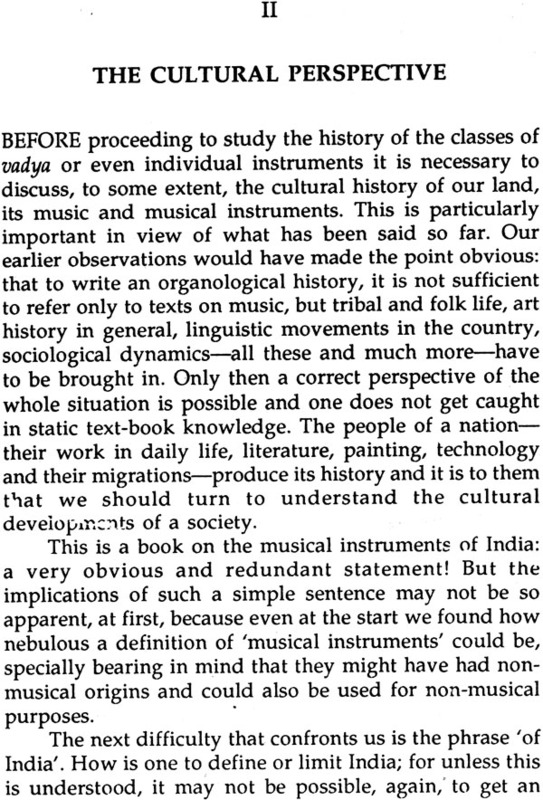 Bearing these in mind, this introductory study attempts to treat an instrument not as an isolate object but as a part of larger socio-musical dynamics, while, of course, describing its structure; those interested in a more technical study may see the author's Musical Instruments of India: their history and evolution as also the ones in the reading list at the end. Numbers in brackets, in the text, refer to figures. It is hoped that the subject will fascinate the reader as it does the writer. 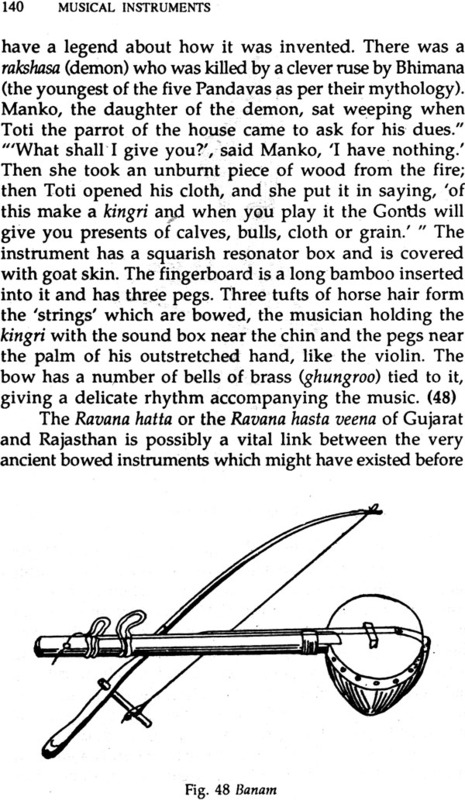 AS we sit and listen to a programme of the vichitra veena or even the Rudra veena, does it ever occur to us that these complicated and ancient instruments might have had their humble origins in the ronza gontam of Andhra or the gintang of Assam: a zither made of a short length of bamboo with one or two strips of its bark raised to form 'strings' beaten with a small stick? Or, perhaps, while a masterly recital of the tabIa is going on; but certainly we do not normally associate it with a cooking pot from which it might have been conceived. The violin bow might well have grown out of the act of fire-making by scraping one rod over another. Music and musical instruments have become so sophisticated and specialised now that rarely, if ever, do we pause to search for their roots in the simpler act of life; we take them for granted! But we must ponder over this a little more, if we are to understand the deeper relations to social developments and to the relation of music to its instruments. And as we probe into this area we begin to see that both might have had their beginnings in non- musical activities. Perhaps, the reader has heard the music of the Nagas of the eastern provinces of India or of the Todas of Nilgiris in Tamil Nadu. These people have a kind of shuffling movement-their dance-accompanied by howls and screeches, resembling their hunting calls. The whole performance has a strange feeling of rhythm and melody. 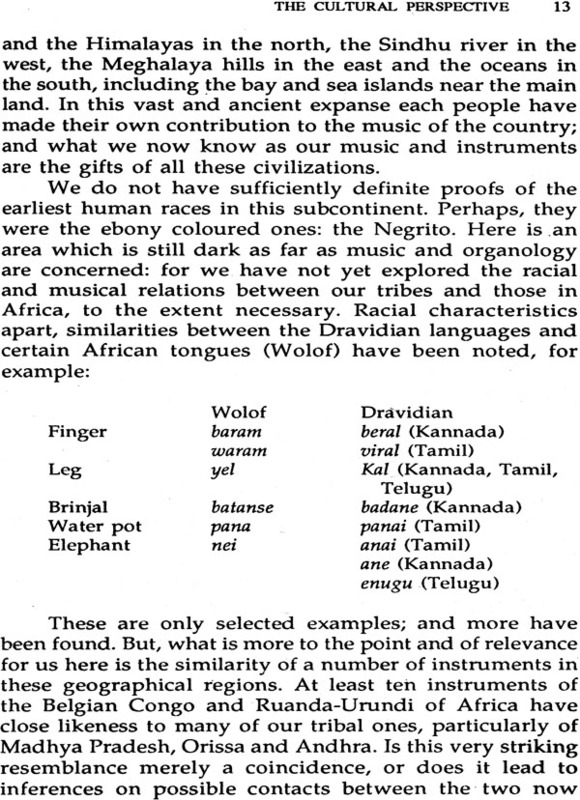 And, if you compare these sounds with the high intricacy of raga and tala, they may not sound musical. Yet there is much music there and many-a raga and tala has, who knows, its first fountains in these non-musical acts of howling. What is true of music in general. is more evident with instruments. Many scholars-and, of course, there are many who dispute the point-are of the opinion that quite possibly the idea of making a harp originated in the twang of the hunting or martial bow and the plectrum in the arrow. Indeed, when Ravana enters the final battle against Rama, he proudly says, "Rama does not know of my skill in war. I shall play the veena of my bow with the plectrum of my arrow; and the hearts of my enemies will tremble and they will flee in disarray." There are theories that folk stringed instruments like the tuntune are really animal traps made portable! These concepts may sound far fetched; but there are instances which are more plausible. Take, for instance, the scrapers used by some of our forest brethren such as the Pulayans, to make fire. This is just a strip of bamboo with notches on the surface on which a rod, also of bamboo, is rubbed vigorously and the heat so generated is used to light a fire. This implement becomes the scraper or stridulator called the kokkara, the gargara, the ruga braiya, the Kirikittaka or the scokti vadya of the devil dancers. More simple to visualise is the transformation of culinary vessels. Pots, pans and other containers' employed for storing, measuring and cooking grain, when covered with hide, become drums; and it is not difficult to see how a tabla or a dagga came into existence this way. An eating plate of metal beaten becomes the thali, a common folk instrument. We have all seen road workers pounding sticks with wooden discs attached at the lower end. This is called the dhimmas or the tippani which is a tool for beating and levelling gravel. As they work the men and the women sing, keeping the rhythm with the dhimmas. After the day's labour, the work movement itself becomes a dance and the stamping stick a musical instrument to keep time-- called the tippani nach. Thus it is evident that more often than not the beginning of music and musical instruments are to be found in tools and activities entirely unmusical. 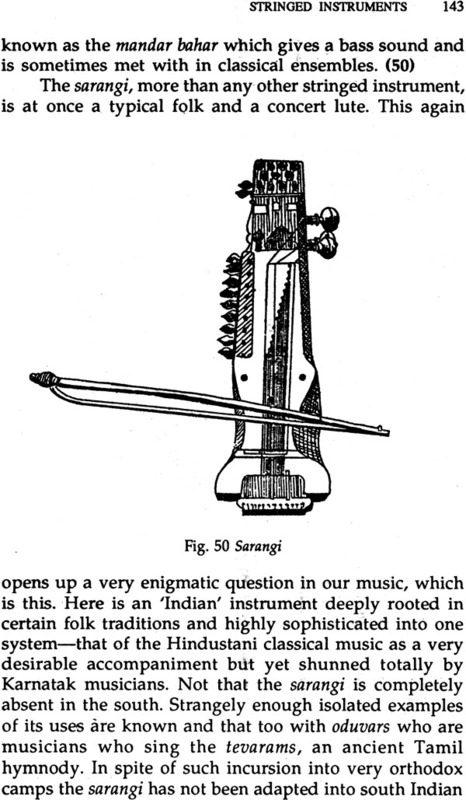 Again, even what we know and call musical instruments are quite often dual or even multiple in functions: sometimes musical and often otherwise. 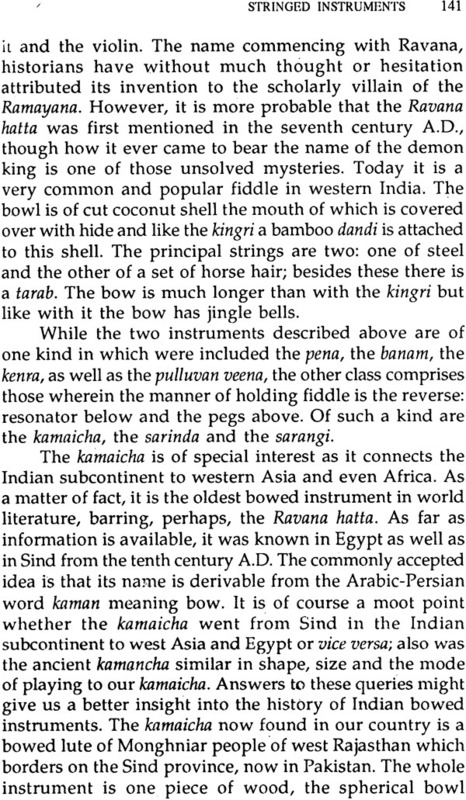 For example, the conch shell (sankh) is a part of the musical ensemble, pancha vadya of Kerala, Karnataka, Orissa and so on. But, like the trumpet, the sankh was also a martial and heraldic instrument-to announce the beginning of a battle or the achievement of victory. Hindus use it in their worship as well, both as an auspicious sound and as a container of holy water or milk. The pancha vadya or the panchamaha-sabda was also an insignia of authority. When a mahamandalesvara-feudal lord-lost a war, he had to surrender his pancha vadya ensemble, of trumpets, gongs, drums and oboes, to the victor. Even the drum is not always restricted to music. It is an effective accompaniment to the rural announcer or the cinema ticket-seller. And of course, the African talking drums are famous: the pitch and intensity of their sounds and their patterns are messages conveyed through long distances. Indeed, "to beat the tammattai" (a frame drum) is an idiom in Tamil meaning "to blow one's trumpet". Note again the dual use of the drum and the trumpet. But there are some strange cases like the lebang gumani Tripura. (1) It is a curious combination of bamboo clappers to which are attached miniature tuntune-s and is played with claps and twangs of a weird quality, along with other instruments. They say that on hearing the sounds, insects attacking the crops in fields gather round the musicians and are caught. Quite a musical way of preventing agricultural rampage! Even more interesting was the stringed instrument of thieves. As they prowled in the dark, the kakali which had a low tone was strummed gently. If no householder woke up, it was an "all clear" for further advance! There is a story in Dandin's Dasakumaracharitra, the first Prince's story (about 6th Century A.D.) in which the Prince says, " ... I learned how the entire city was constituted according to wealth, professions and morals. Then, in the darkness as black as the poisonous stain on Siva's throat, I set out, wrapped in a dark-blue coverall and with a sharp sword buckled on, carrying the necessary equipment and tools; mattock, soft-sounding string instrument (kaka1i), tongs, dummy head, sleeping powder, trick lantern, 'fly- in-light' bugs, and so forth I found the house of a wealthy miser, made a breach in the wall, entered the house after having reconnoitered the interior through a small peephole, roamed, unmolested around inside as if it were my own home, stole a large capital of the merchant's funds and made off."